Venus, the second planet from the sun, is an oddity in many ways. With this week's ultra-rare transit of Venus, in which the planet will pass in front of the sun as seen from Earth on Tuesday (June 5), we here at SPACE.com think it's a great time to take a look at the peculiar quirks of one of our closest neighbors in the solar system. NASA/JPL-Caltech/ESA; image created by Ryan Ollerenshaw and Eric DeJong of the Solar System Visualization Group, JPL. There are more volcanoes on Venus than on any other planet in the solar system. Astronomers know of more than 1,600 volcanoes on its surface, but there are likely many more too small for us to see. Scientists think most of these are dormant, though a handful may still be active. A day on Venus lasts 243 Earth days (that's how long it takes Venus to make one rotation), while a year on Venus (its revolution period around the sun) is shorter, at just 224.7 Earth days. Of all the solar system's planets, Venus is the closest to a twin of Earth. The two bodies are nearly of equal size, and Venus' composition is largely the same as Earth's. The orbit of Venus is also the closest to Earth's of any solar system planet. Both worlds have relatively young surfaces, and both have thick atmospheres with clouds (however, it's worth nothing that Venus' clouds are mostly made of poisonous sulfuric acid). Because the bulk of its atmosphere is made of carbon dioxide, an extreme greenhouse effect is warming the surface of Venus. Temperatures there can reach a scorching 870 degrees Fahrenheit (470 degrees Celsius). "The surface is hot enough to melt lead due to its runaway greenhouse atmosphere," Sue Smrekar, a scientist at NASA's Jet Propulsion Laboratory in Pasadena, Calif., said in a statement. The air pressure on the surface of Venus is extreme — about 90 times higher than the pressure at sea level here on Earth. In other words, the pressure on Venus is about the same as the water pressure on Earth about half a mile (1 km) under the ocean. Venus is rare among the planets in that we can see it cross in front of the sun. Only Venus and Mercury do this from the vantage point of Earth. Venus transits occur rarely, with pairs separated by eight years coming around less than once a century. One of these unusual occasions is coming up June 5-6, 2012, when a transit of Venus will be visible from North and some of South America, western Asia, the eastern half of Africa, and virtually all of Europe. It is only the seventh time since the invention of the telescope that humans have witnessed a Venus transit. While Venus is not nearly the largest planet of the solar system, its proximity to Earth makes it the brightest of the planets in the sky. It also qualifies as the second-brightest object in the nighttime sky, after only the moon. In fact, Venus can appear so bright that a pilot aboard an Air Canada flight in January 2011 actually mistook the dazzling planet for an oncoming aircraft. The pilot sent his plane into an emergency dive to avoid a midair collision with what investigators later determined was Venus, which was still safely millions of miles away, according to Canadian air transportation officials. Venus has been a target of observation for millennia. The ancient Babylonians tracked its wanderings through the sky in records that date as far back as 1600 BC. The Greek mathematician Pythagoras was the first to discover that the brightest stars in the morning and evening sky were in fact the same object, Venus. 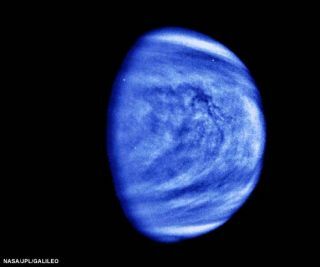 "Throughout history, Venus has been one of the most studied and speculated-about celestial bodies in our sky," Smrekar said. Winds swipe across Venus at super-fast speeds that can reach 450 miles an hour (724 kph) in its middle cloud layer. These Venusian winds are faster than the speediest tornado on Earth. Because Venus orbits the sun within Earth's orbit, the planet appears to have phases like the moon. When Venus is on the opposite side of the sun, it is in full phase, while it appears in new phase when it is between the Earth and the sun. The first person to witness these phases was Italian astronomer Galileo Galilei in 1610.